Talks to ease the conflict over Georgia's Moscow-backed breakaway regions were suspended until next month on Wednesday after diplomats failed to get Russia and Georgia to agree on who was allowed to take part in the talks in Geneva. The sticking point was whether, and if so how, representatives from South Ossetia and Abkhazia should be allowed to participate. So, what are the prospects for the next phase of the talks planned on 18 November? It is safe to say that the Russians were not overly concerned about last week's talks going ahead. At the last moment they insisted that Abkhazian and South Ossetian representatives be included fully in the talks, knowing that this would be unacceptable to Georgia. Russia is posturing, it seeks to show that there will be no "going back" on recognition of Abkhazia and South Ossetia as independent states. One might say Russia is sending a message to others who it hoped would be more forthcoming in recognition of these two regions, but have thus far failed to act on Russia's wishes. Russia may be trying to create some momentum here, and will be looking for reactions from CIS states. 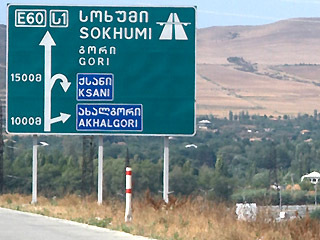 Georgia is deeply concerned about the continuing occupation of the Akhalgori region, which it believes is in violation of the ceasefire agreement. This area is populated by Georgians, and was controlled by Georgia before the war. It is only a short drive from Tbilisi. Georgia, rightly, believes it could be used to launch an attack on Tbilisi itself. There may be strong pressure to resolve at least the issue of Russian occupation in the Akhalgori district before the talks are due to resume on 18 November. And there are other substantive disagreements about the interpretation of the ceasefire agreement, eg, Georgia does not accept that a three fold increase in troop numbers in Abkhazia and South Ossetia is in keeping with the spirit of the agreement. And Russia have made no guarantees in respect of the return of refugees. Unfortunately the International Court of Justice have not sent a strong message to Russia on this point. So, there is hope for these talks to resume with some positive results, but this will depend on a whether some compromises can be made that clarify certain issues before they begin. Akhalgori will be an important part of that. And finally, the Euro-Atlantic alliance's continued and strong support for Georgia will be critical.